Today is Yuri's night where the world celebrates the first human spaceflight on April 12, 1961. Over the past 50 years we have had varied successes and advancements in our space technology. I believe that today we are on the brink of a new space revolution. The 1960's was the birth of modern computing. The transistor radically changed the size and cost of building digital computers. At the time, there were only a few computers in the world, they were extremely large, complicated, and you were fortunate if you could get any time on a machine. It was difficult for people to imagine the broad availability of computing. They were for precise calculations of unique problems. Clearly that has dramatically altered from room-sized, multi-ton hand built machines to ubiquitous, handheld devices with more power and connectivity than was ever imagined. This access to nearly unlimited computing power revolutionized commerce, communications, and inspired entrepreneurship from garage hackers to multi-billion dollar companies that are built on ideas and code. I believe that we will see the same trajectory of the space industry. Satellites have been large, expensive, and limited to a few institutions that could fund, operate and utilize them for unique problems. But that's changing. We're beginning to see the advent of hobby space engineering. Startup companies inspired by the X-Prize foundation brought the attention to the public. But the revolution is quietly and methodically moving forward as the components and capability for rapidly developing and deploying satellites dramatically decreases. 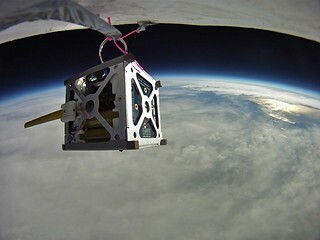 NASA is testing launching off the shelf commercial Android mobile phones into orbit called Phonesat. You can now buy books on how to build your own satellite platforms from O'Reilly. UpdateAnd the government and agencies are hosting open events for the technology and science communities to collaborate on fast paced, iterative solutions such as the SpaceAppChallenge. There are still physical boundaries that make access to space difficult and expensive. When you need to throw something at 7.8 km per second, it is not going to be easy. Fortunately with the increase in commercial satellite activity there are opportunities to piggy back on other payloads. At $10-12k it is still expensive for a hobby. But consider that the first Apple Lisa computer cost $9,995, in 1985. That's $22,600 in 2012 dollars. There is a lot of childhood excitement and vision captured in our goals for the future of space. One day we will again walk on the Moon and likely on Mars and hopefully other bodies. In the meantime, I'm excited to see the new advent of an open and innovative space engineering culture.